Mary Moments: Happy St. Patty's Day! 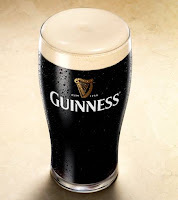 To celebrate St. Patrick's Day this year (I am one quarter Irish, after all!) 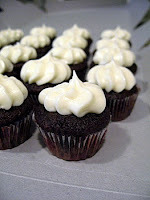 I baked Guinness Chocolate Cupcakes and wore a green T-shirt under my scrubs and green (malachite) earrings . Everyone at work loved the cupcakes! There actually is a cup of Guinness Stout in the recipe and I tried to make the frosting look like Guinness foam. After work I went for a walk on the beach to celebrate the first day of the year with sunshine and temps over 60 degrees. I crossed paths with a little girl, about 4, with a green T-shirt that said, "Kiss me, I'm a little Irish". She pointed at my green shirt and said, "We're almost the same". I told her I'm Irish, too. Then she proceeded to tell me how much they like going to the beach this time of year because no one is there and they love the peace and quiet. I guess she didn't think I was intruding on their peace and quiet because she kept following along with me until we reached her dad and parted ways. Cupcakes, Guinness and a sweet little girl. What more could I ask for on St. Pat's Day? Very cool looking cupcakes! You did a great job on that foam, and I'll be you could float a shilling...er 50 Euro Cent coin on it! Back in the day I used to bake cupcakes with a different green intoxicant in them. Brownies too. Weren't the '70s a great time? Denizen, that explains a lot! Happy S.P. Day to you! Sounds like you had a good one! I love to meet random little people, too! Oh, and by the way, it's a good thing you have to wear those masks over your face so your patients couldn't smell the beer on your breath after eating the cupcakes!! !